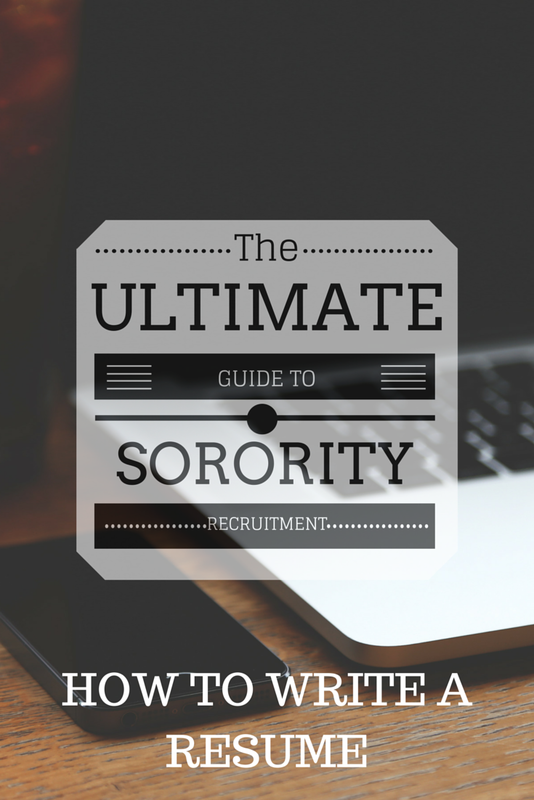 As I began my post about preparation for sorority recruitment I realized I had a lot to say specifically about the recruitment resume itself. So here it is. 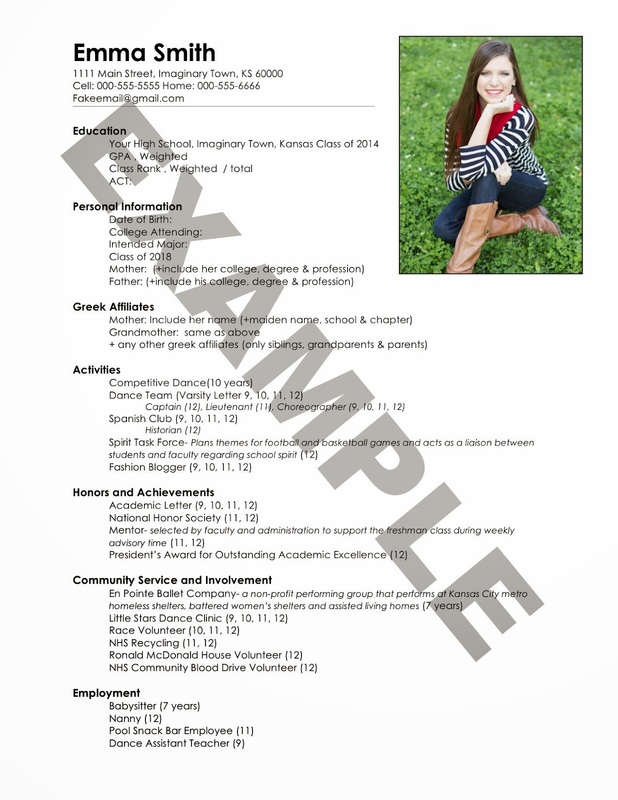 All you need to know (according to me) about making your recruitment resume. Before I begin, there are a lot of differences between what sororities request of their PNMs (potential new members). For some, recommendation letters are required. For others, it’s suggested. Whether you’re at one school or another, these letters certainly boost your shot at becoming a member of a chapter. The resume is only one part of getting a recommendation letter, but it’s important! This, my friends, is my pride and joy. Call it “nerdy” or whatever you want, but I put a lot of time and effort into my recruitment resume. This one piece of paper contains all of my accomplishments from the last four years. For my privacy, I’ve changed some of the information (No, I don’t actually live in Imaginary Town, KS) but I wanted you to get a sense of the format. From my experiences of browsing the numerous recruitment resumes my mother has gotten, advice from my father and common knowledge, I’ve compiled some recruitment resume writing tips. Make your name jump from the paper when someone looks at the resume. This doesn’t mean using Curlz or some other decorative font, it means making your name bigger, and bolder than the rest of the text. Include your contact information. You need to be reached. Include a picture of yourself. Your face is part of your “brand” and your goal is to be recognized. This means putting it everywhere (within reason). DO include your weighted & unweighted GPA and class rank. Most recommenders have to know this stuff (when they’re filling out forms) so its better to include than to not. Please include your college and intended major. Just because you feel like you’ve told everyone in the world your plans for next year it doesn’t mean your friends mom knows or remembers. Keep your activities and involvement short and sweet. If it was a high school thing add the grades (9, 10, 11, 12) you were involved. If you’ve done it most of your life, like my competitive dance, include the years to show your dedication. DO include your leadership roles and when you held them. This is a big factor to many sororities. If an activity is unfamiliar to most (i.e. “Spirit Task Force) give a brief description. Community service is important. Do it, include it, love it. For each category, start with the longest lasting, most involved activity, to the least. If they’re all one year, go from newest to oldest. Most your font readable. I went with Century Gothic. And don’t try to do cutesy colors. Go black. Make your page easily navigable. Don’t try to make it “artsy” or “different.” Go top to bottom. It’s easy to read and easy to figure out. Try to make it one page. It’s so much easier for everyone to not have to worry about losing a page. It also looks more complete if it fits on to one page. Play with font size and margins if you must. Print it on nice paper. Not the cheap printer paper. This document is important. Make it look like it is. I used some nice paper with rounded edges to make it stand out amongst others. Like this post? Check out the rest of my recruitment posts here! Did you use my tips? Feel free to comment below! Next Post Recruitment Is Near!